(above): Jaap van Zweden conducts the New York Philharmonic in the 2018 Opening Night Performance, September 20, 2018. Credit: Chris Lee. The New York Philharmonic welcomes you to the 2018-2019 syndicated radio broadcasts by one of the world’s longest-running and most celebrated orchestras! Now entering its 15th season, the New York Philharmonic This Week gives listeners all over the world an opportunity to hear select concerts from the current subscription season while also showcasing programs curated from the orchestra’s archives and commercial recordings that celebrate a particular composer, artist, or theme. In recent years, this has included award-winning profiles of former Music Directors Lorin Maazel and Pierre Boulez plus in-depth examinations of monumental works, such as Mahler’s Ninth Symphony and the Turangalila-Symphonie by Messiaen. Important themes that will be explored this season include a Mahler showcase, featuring performances of his symphonic repertoire with fantastic guest conductors and soloists. You won’t want to miss it! In 2015, The New York Philharmonic This Week received the Grand Jury Prize at the New York Festivals International Broadcast Competition and it has consistently won top prizes (16 in the last two seasons alone) in categories that include Best Director, Best Sound, and Best Regularly Scheduled Music Program from The New York Festivals, the AVA Digital Awards, and the Hermes Creative Awards. The New York Philharmonic’s first live national radio broadcast took place on October 5, 1930, over the CBS radio network. On that Sunday, Erich Kleiber was on the podium leading the Orchestra at Carnegie Hall. Since that historic broadcast, the Philharmonic has enjoyed an almost continuous presence on national radio. 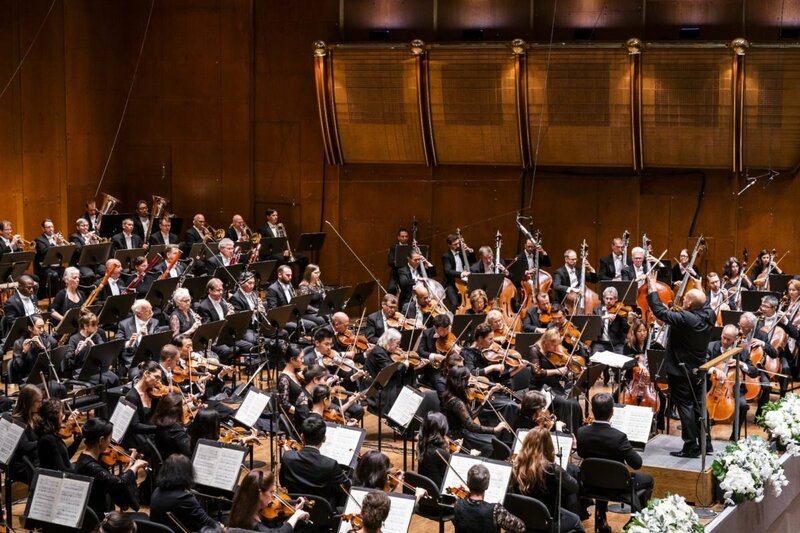 Advancing its role as a media pioneer, the Philharmonic, since 2002, has shared its radio broadcasts with a worldwide audience through its website, nyphil.org. In 2004 the New York Philharmonic was the first major American orchestra to offer downloadable concerts, recorded live. Following on this innovation, in 2009 the Orchestra announced the first-ever subscription download series, Alan Gilbert: The Inaugural Season, available exclusively on iTunes, produced and distributed by the New York Philharmonic, and comprised of more than 50 works performed during the 2009-10 season. The self-produced iTunes Pass Series has continued each and every year since then. Since 1917 the Philharmonic has made nearly 2,000 recordings, with more than 500 currently available — including recent releases on Da Capo and Naxos featuring music of Carl Nielsen, Magnus Lindberg, and Christopher Rouse. Broadcasts are available on the Philharmonic’s website, nyphil.org, for a minimum of two weeks following the original uplink. Emmy and Golden-Globe Award-winning actor Alec Baldwin is the host of the program, New York Philharmonic Associate Director of Media Mark Travis is the writer and producer, and New York Philharmonic Audio Director Lawrence Rock is the engineer for the series. On June 18, 2010, The New York Philharmonic was honored with two 2009-10 ASCAP Awards for Adventurous Programming at the League of American Orchestras’ Annual Meeting at its 65th National Conference in Atlanta, Georgia. The Philharmonic received the Award for American Programming on Foreign Tours, and a First Place Award for Programming of Contemporary Music. The following year, the Philharmonic received the 2010-11 ASCAP Award for Adventurous Programming, winning first place in the Awards for Programming Contemporary Music. For 2012-13, the orchestra was again awarded the ASCAP Award for Adventurous Programming and the Leonard Bernstein Award for Educational Programming. This exciting broadcast venture is made possible with the generous support of The Kaplen Foundation and the Audrey Love Charitable Foundation, the Philharmonic’s corporate partner, MetLife Foundation and the National Endowment for the Arts.